After successfully launching Bulgaria’s first telecommunications satellite on Friday with the added bonus of an ‘extra-toasty’ first stage landing, a Falcon 9 took to the skies again on Sunday – blasting off from SpaceX’s West Coast launch site to send the second batch of Iridium-NEXT communications satellites on their way and returning the rocket’s first stage to the company’s second Drone Ship for future re-use. 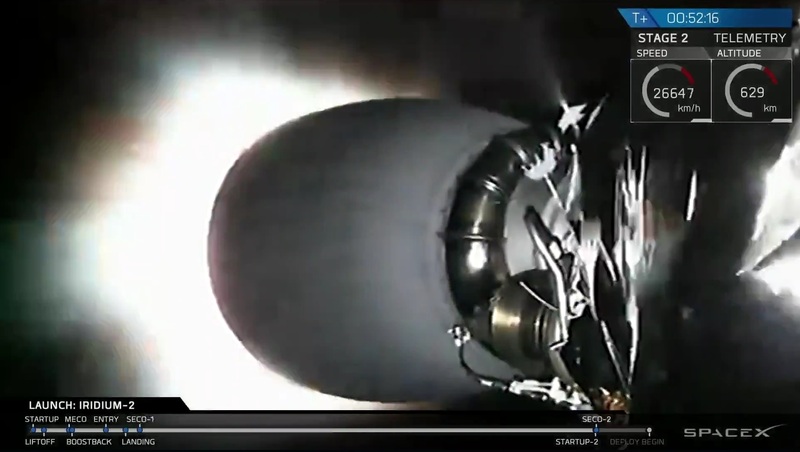 Sporting new titanium grid fins, a factory-new first stage and slight modifications on its second stage, Falcon 9 blasted off from Vandenberg’s Space Launch Complex 4E at 20:25:18 UTC on a heavy-haul to Low Earth Orbit with a total payload upmass in excess of nine metric tons. 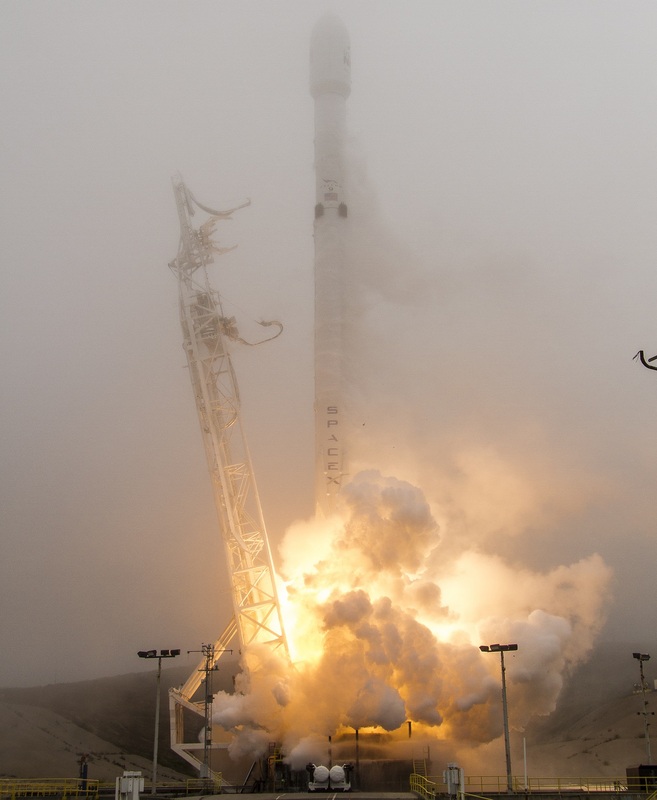 Firing its nine Merlin 1D engines at full throttle, the 70-meter tall vehicle entered an ascent path almost directly south, intending to place the ten Iridium satellites into a high-inclination orbit to enable coverage of the entire planet. 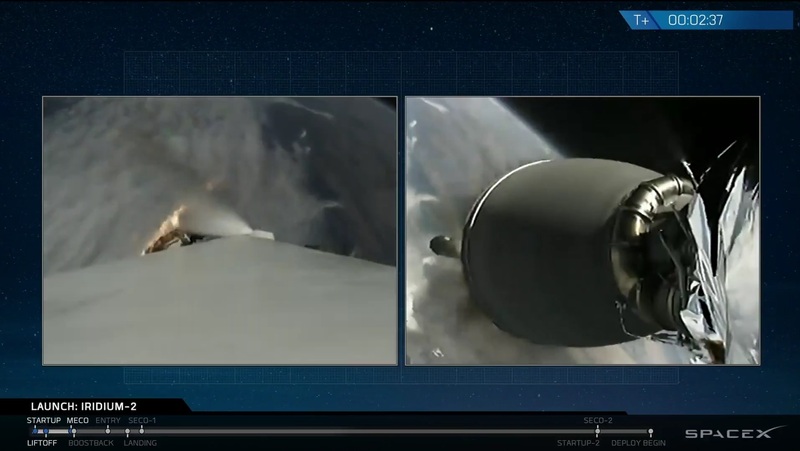 The two stages parted ways two and a half minutes into the flight with the first stage booster homing in on the ‘Just Read The Instructions’ Drone Ship and the second stage firing up on a burn of six and a half minutes to put the stack into a preliminary orbit. Unlike Friday’s first stage return from a particularly high-energy mission that required a do-or-die three-engine landing burn, Sunday’s mission featured a more lofted trajectory for the first stage with manageable speed and a more-controllable single engine landing burn – culminating in a soft touchdown on the drone ship in some sporty weather to give SpaceX its eleventh recovered first stage. 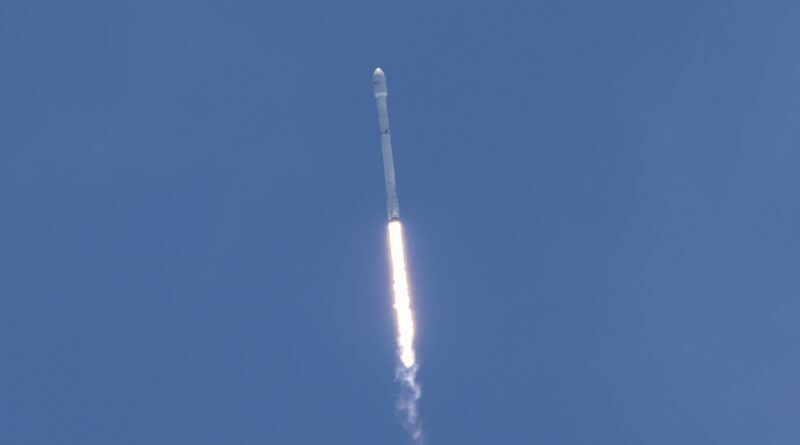 The second stage coasted for half a lap around Earth before firing its MVac engine for just three seconds to circularize the orbit over 600 Kilometers in altitude, setting up for the methodical departure of the ten Iridium-NEXT satellites over the course of a 15-minute sequence, allowing SpaceX to put the check mark behind another successful orbital delivery and probably the busiest weekend in the company’s history. Sunday’s launch was the 37th of a Falcon 9 rocket, the 17th in the Full Thrust configuration and the ninth in 2017 – breaking the record for most SpaceX missions in a calendar year just as 2017 reaches its half-way mark. The first stage landing was the ninth recovery success in a row with SpaceX now 13/18 overall, and 8/13 for Drone Ship landings, it was the second successful Pacific-based landing. 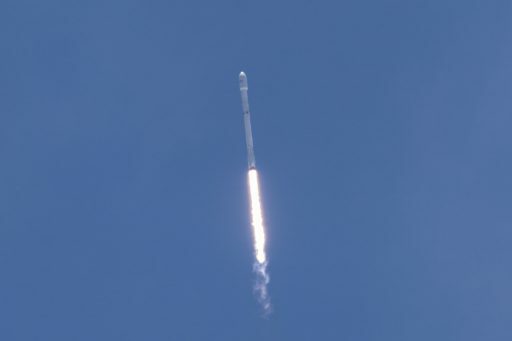 Sunday’s launch was the second of eight planned Falcon 9 missions in support of Iridium, facilitating the complete replacement of the previous Iridium communications satellite constellation of 66 active satellites plus in-orbit spares – the largest constellation upgrade in history coming with a price tag of $2.9 billion including around $800 million for launch services & ground infrastructure. 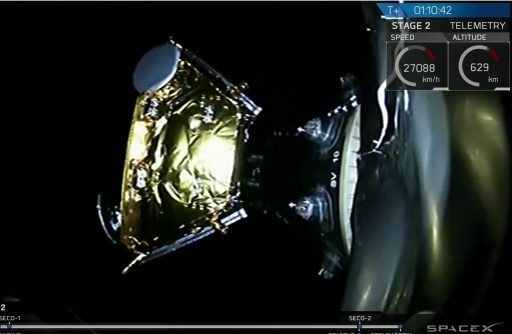 The Iridium constellation was in dire need for replacement as most of the satellites had been in operation since the late 1990s and no more orbital spares were available when the first of the next generation satellites reached orbit on January 14, 2017. 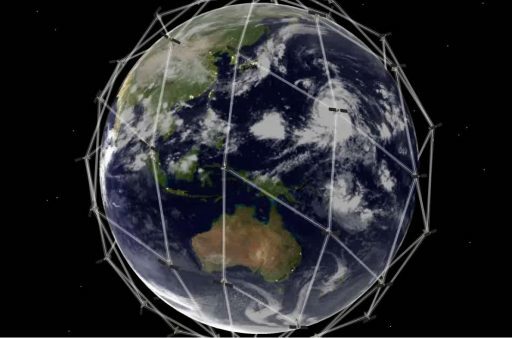 The Virginia-based communications provider hailed the performance of the new additions to the constellation after the first eight NEXT satellites assumed active roles within the global communications infrastructure, routing data packets and voice communications across the globe. Iridium contracted Thales Alenia Space to build 81 identical Iridium-NEXT satellites – 75 of which will be launched through mid 2018 to fully rejuvenate the active constellation and have at least one spare available in each orbital plane with more spares available on the ground to be launched when needed. Each Iridium-NEXT satellite, weighing in at 860 Kilograms, hosts a powerful communications terminal that covers a 4,700-Kilometer footprint on Earth to provide different services from telephony over short-burst data delivery all the way to newly introduced high-capacity services that can reach data speeds up to 8Mbit/s – not possible with the heritage satellite generation. It was a busy weekend double header for SpaceX with two launches just over 48 hours apart – a new record for the company and a feat only few launch vehicle families have achieved in the past. 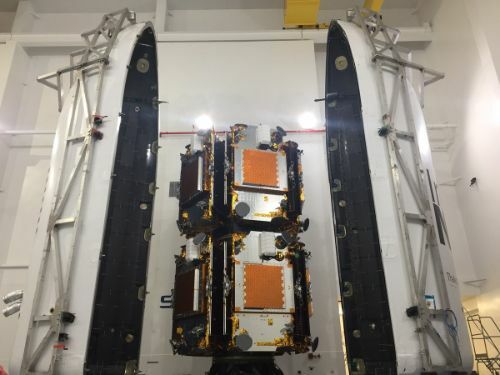 Operations kicked off at the East coast with the launch of BulgariaSat-1 aboard SpaceX’s second re-flight mission, utilizing the first stage from the first Iridium-NEXT mission. Bulgaria’s first commercial satellite enjoyed a smooth ride, departing the second stage of the rocket after being placed into the expected Supersynchronous Transfer Orbit peaking over 65,000 Kilometers in altitude. 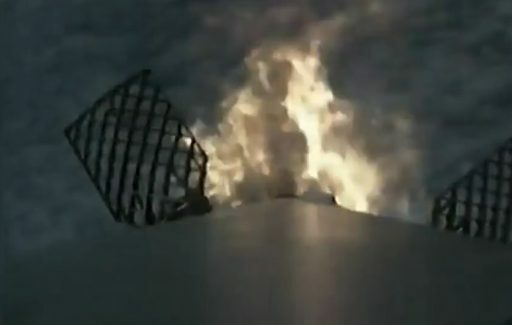 Booster 1029.2 beat the odds and managed a very challenging drone ship landing, surviving the hottest re-entry encountered by any Falcon 9 and acing a three-engine landing burn despite a last-second lateral deviation, either by a heavy gust of wind or a problem onboard the vehicle. Nevertheless, the booster managed to remain upright on the drone ship’s deck despite using most of its emergency crush core capability within the four-fold-out landing legs. The Falcon 9 rocket launching on Sunday was slightly different from Friday’s vehicle – featuring a new first stage, new titanium grid fins and a slightly modified second stage that allows for a faster propellant loading sequence. 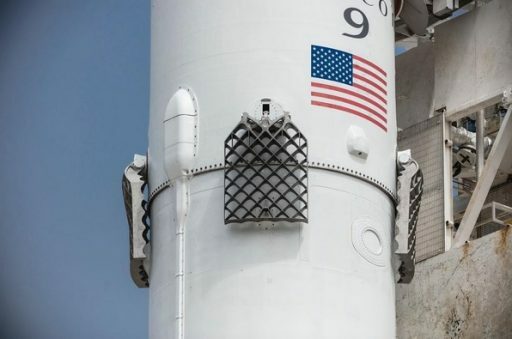 The new grid fins, cast & cut from a single piece of titanium, replace previously used aluminum fins that featured an ablative coating for thermal protection. 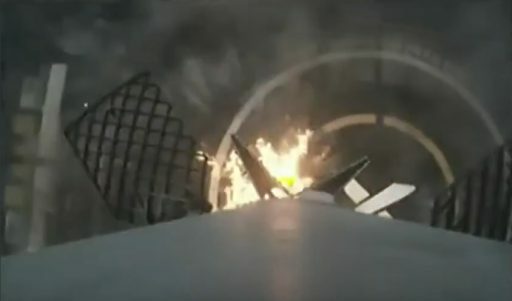 As evident in onboard video from numerous landings, the old fins were prone to burn during the peak-heating portion of re-entry, requiring refurbishment and/or replacement after flight which is not in-line with SpaceX’s drive to create a first stage that can be easily re-flown with minimal refurbishment cost. The new titanium fins can easily withstand the re-entry heating environment with no need for refurbishment after landing, even for particularly hot entry speeds. Additionally, the new grid fins are around 16% longer than the previous generation, increasing the cross section area by a factor of 1.4 to provide more control authority during atmospheric descent. They also feature a new aerodynamic design to improve air flow in the hypersonic phase of the descent and can provide more lift. These changes are primarily relevant for future Falcon Heavy missions but will also help Falcon 9 navigate through heavier winds heading back in for landing. Another benefit of the new fins will be a reduction in fuel margins for the landing maneuvers, resulting in an overall increase in performance. The change on the second stage (Block 4) is one of several measures implemented after the September 1st explosion of a Falcon 9 during tanking ahead of a Static Fire Test. In the immediate aftermath, the propellant loading sequence for subsequent missions was stretched from 35 to 70 minutes and SpaceX said hardware changes to the second stage’s Liquid Oxygen and Helium systems will enable to compress the tanking sequence once again. These changes are now finding their way into operational vehicles and will ultimately allow Liquid Oxygen and Helium to be loaded simultaneously as part of a rapid sequence without creating potentially hazardous conditions that could lead to a catastrophic deflagration. To that end, Sunday’s propellant loading sequence was compressed by ten minutes with Falcon 9 entering its Automated Countdown Sequence at the T-1-hour mark, coinciding with the start of Rocket Propellant-1 loading followed at T-35 minutes by Liquid Oxygen flow to fill the two-stage rocket with over 500 metric tons of sub-cooled LOX at -207°C and Kerosene at -7°C. 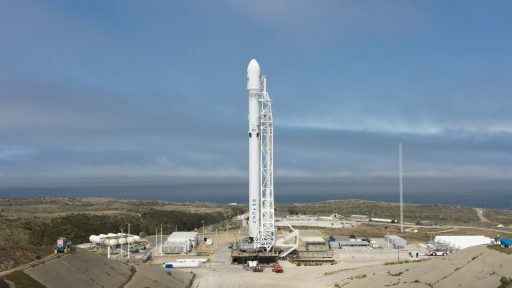 Propellant loading time is critical for the Falcon 9 due to the fact that its propellants will warm up the longer they are in the tanks, causing a decrease in density and with that propellant mass & performance. The Block 5 second stage will implement further changes to fully avoid buckling issues within its pressurant tanks that were found to be the at the root of the September 1st mishap. 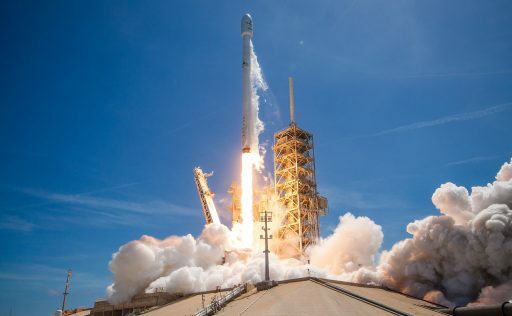 Falcon 9 enjoyed a particularly smooth countdown on Sunday, coming after an equally smooth launch campaign that started on May 19 with the arrival of the first stage followed by the second stage & fairing six days later. The ten Iridium satellites also arrived in that time frame and took their places around a two-tier dispenser system, meeting their Falcon 9 rocket earlier in the week after Tuesday’s Static Fire Test. 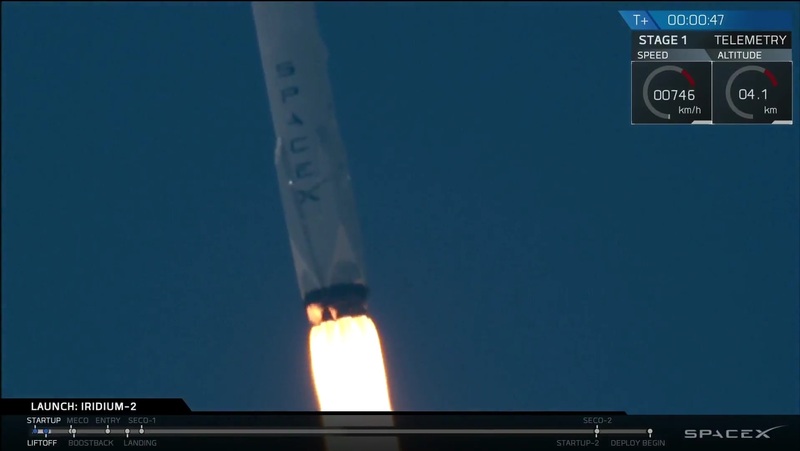 With no issues encountered in the rapid propellant loading operation, Falcon 9 entered its fast-paced countdown sequence at T-7 minutes when starting the chilldown of its engines that was followed in close succession by final checks of engine trim valves & actuators, the transition to internal power, the retraction of the Strongback, arming of the Autonomous Flight Termination System and the handoff to Falcon 9’s triple-redundant computers. Falcon 9 came to life at T-3 seconds, soaring to a launch thrust of nearly 700 metric ton-force for a liftoff timed precisely for 20:25:18 UTC – the in-plane time for Plane 3 of the Iridium constellation. Rising from its SLC-4E launch pad, Falcon 9 climbed vertically for less than 20 seconds before beginning to depart on a due southerly trajectory, targeting an orbit inclined 86.66 degrees. Guzzling down 2,500 Kilograms of chilled propellant per second, the nine Merlin 1D engines quickly pushed the rocket to the speed of sound and throttled back briefly around the period of Maximum Dynamic Pressure 69 seconds after liftoff. From there, the first stage continued firing on all cylinders until its burn ended at T+2 minutes and 24 seconds. The first stage boosted the rocket’s speed to 1.9 Kilometers per second as opposed to Friday’s high-energy delivery that had a staging velocity of 2.35km/s – highlighting the drastic differences between heavy-haul missions to LEO and high-energy GTO deliveries. Four pneumatic pushers provided separation of the stages four seconds after MECO and Booster #1036 wasted no time in preparing for its homecoming, starting to home in on the Autonomous Spaceport Drone Ship located 300 Kilometers from the launch site, much closer than for Friday’s mission that had the ‘OCISLY’ drone ship park 680km from Cape Canaveral to catch its Falcon 9. Stage 1 fired up its cold gas thrusters immediately after staging to initiate the flip to an engines-first position followed by ignition of the central Merlin 1D engines at T+2 minutes and 43 seconds followed by two of the outer engines at T+2:49 on a partial boost back burn that lasted ~27 seconds and slowed the vehicle’s forward velocity to control the downrange travel distance. Accelerating back toward the atmosphere, the booster deployed the new grid fins and fired up on a 19-second entry burn at T+5 minutes and 53 seconds to slow down by some 550 m/s and set the course toward the drone ship. 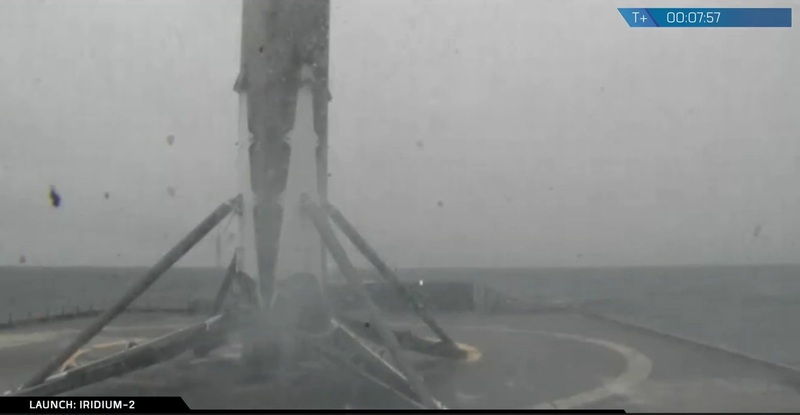 ‘Just Read The Instructions’ had to be relocated shortly before launch because of extreme weather in the landing area, but even in the new landing zone, the ship’s deck was more of a moving landing pad rather than a stable landing surface – adding difficulty to what would have been one of the easier returns for the Falcon 9. 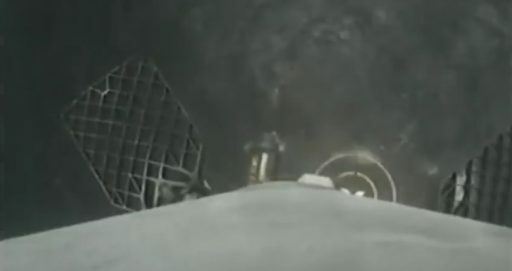 Hitting the atmosphere significantly slower than Friday’s mission, the booster encountered a significantly lower heat load, using the grid fins to fine tune its course for the final landing maneuver. The disturbed weather became evident in stronger vibration seen as the booster approached a dense cloud layer associated with quite some movement by the grid fins to keep Falcon 9 on course. With plenty of propellant reserves, Sunday’s mission had the luxury of a 32-second single-engine landing maneuver that provides more time for corrections and finer control over the landing speed. Balancing on the central engine, Falcon 9 was in for some heavy throttling to arrest its vertical speed when coming into contact with the drone ship. The four landing legs deployed in the last seconds of powered descent and Falcon 9 gracefully touched down near the center of the JRTI drone ship at T+7:44, continuing a streak of successful landings – now up to nine. Coming home from the edge of space through a fairly gentle entry, this booster is a prime candidate for re-flight following its return to the Port of Los Angeles in the coming days. While all eyes were once again on the first stage, it was the second stage that earned the money on Sunday – lighting up its 95,000-Kilogram MVac engine two minutes and 35 seconds into the flight on a planned six-minute and 29-second burn to lift the stack into a slightly elliptical Low Earth Orbit. The fairing split open and dropped away three minutes and 16 seconds into the flight after the vehicle had reached 110 Kilometers in altitude where aerodynamic forces are no longer a concern. Stage 2 continued flying true and level, safing its Flight Termination System and shutting down the engine nine minutes and eight seconds into the mission, transitioning to a lengthy coast phase of 43 minutes, or half an orbit. While coasting, the second stage crossed the Pacific, flew over Antarctica and entered a leg to the north, passing over the Indian Ocean and climbing up to the apogee of the transfer orbit, 625 Kilometers in altitude so that the second burn could serve as a circularization maneuver. MVac fired up again 52 minutes and 15 seconds into the mission on a very brief burn of only four seconds that accelerated the stack by 126 meters per second, aiming for a circular orbit of 625 Kilometers that acts as a staging and maintenance orbit for the Iridium constellation. Having arrived at the planned orbital destination, the second stage coasted for another five minutes before initiating the delicate deployment sequence that saw one satellite depart the dispenser every 100 seconds to ensure proper spacing between the spacecraft. SpaceX confirmed all ten Iridium satellites made a clean separation and Iridium will work through the night to confirm all ten are alive and well. 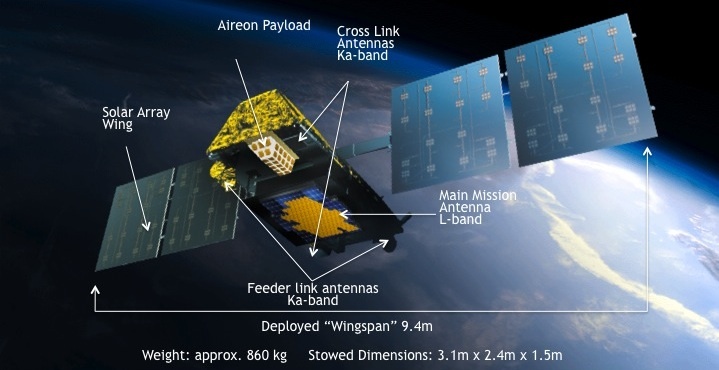 All satellites are activated in the coming days for a series of checks involving their communications payloads and the L- and Ka-Band space-to-ground links and Ka-Band inter-satellite links. Five of the satellites will raise their orbit to Iridium’s operational altitude of 780 Kilometers to enter an active role in Plane 3 via instantaneous handovers from retiring satellites to avoid any outage in service. Five of the satellites launched on Sunday will enter multi-month drift campaigns into Planes 2 and 4 of the constellation in a carefully planned replacement sequence that will ensure the constellation is up to operational strength as soon as possible after all new satellites are in orbit. 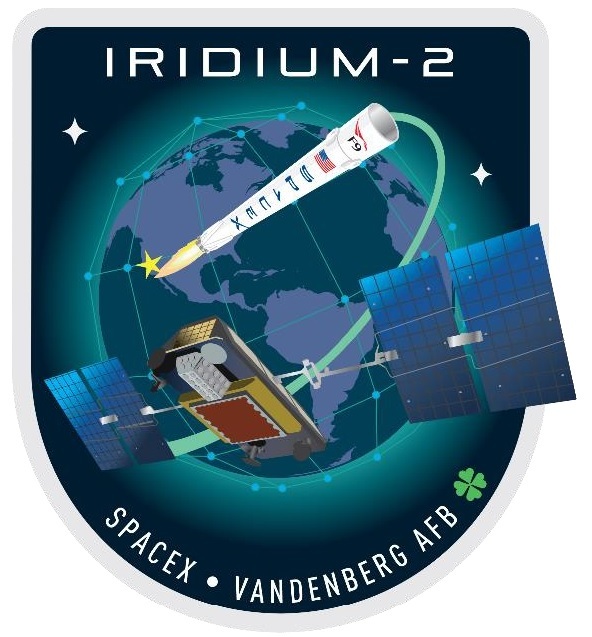 Currently, Iridium Mission 3 is looking at a provisional launch date of August 24, targeting Plane 2, to be followed by the fourth launch no earlier than October to place another ten satellites into Plane 4. Provided SpaceX can keep up its current pace, all eight Iridium launches – the last featuring only five Iridium satellites – will be complete by mid-year 2018. Copyright © 2019 Falcon 9 – Iridium 2. All rights reserved.